Before we describe the movement of the through the 22 Oracles, it is important to understand how the framework is laid out and how the energy of any house is affected by the planetary ruler (based on its row) and the chakra with its astrological sign and chakra ruler (based on the column). When looking at the planetary ruler for any row, remember that when reading for the rising spread, use the planetary ruler on the right of its row, and for the moon spread use the planetary ruler on the left. Please see the Planetary Pairs for a description of the relationship between the planetary ruler for any row. When looking at the chakra ruler for any column, remember that the signs along the top and bottom will designate which planet rules in that sign (see Cosmic Layers). The 1st chakra being ruled by , the 2nd chakra by , etc. As has been stated, rules by day and by night. This is denoted by the shading applied to the signs along the bottom and the top. Over time, the outer planets of Uranus, Neptune and Pluto became visible to our 3D reality, so now rules by day and rules by night. See the Astrology reference page for a description of the symbols used here. Let's use an example to clarify this. Since the diagram on the left represents the sun spread, any house in the framework will describe the pure potential available for the card assigned to that house. When reading any Card in the sun spread, both the Rising and Moon energies are combined for that house. For instance, when reading the rising energy for the in the sun spread, we see that the planetary ruler is and it rules in in the 1st chakra (which is governed also by ). This represents a person who has command over any limitation that may be imposed upon them. Having the rising energy rule in the night sign of means that they will be gifted with an intuitive ability to understand the workings of constraint. At the same time, given that the rising energy is working in the night, that person will likely have to obtain these gifts through their own merit, proving to themselves that they are worthy of such powers. Based on their own ability to differentiate discernment from judgment, will be the allowance they offer themselves in realizing their own opportunity. In combination with this, reading the Moon energy for in the sun spread we have ruling in in the 1st chakra, which is governed by . The Moon force acts as the underlying subconscious drive that externalizes the moment. Here, will expand the Ego character as it aligns with the eccentric, imaginative powers of in order to break down the traditional karmic patterns crystallized by . The reality of these opposing forces playing out within their awareness gives these people a forceful, charismatic expression that is both alluring and intriguing, often being well ahead of their time. However, when does not accomplish the balance of its positive/negative forces, the forcefulness of their own character can turn within to become an overwhelming distraction to their pure potential. Now that we have defined the manner in which the quadrations can be formed to manifest the unique 22 combinations, let's see how the individual card houses can become a reflection of this new set of structures. By following the through the various Oracles, and noting the house in the framework that it resides in both the rising spread and moon spread, we can now designate that house in the sun spread to the Oracle for that year. That means that for year 0 (at the time of birth), the combination of the sun spread, moon spreadand rising spread is represented by the Tarot Arcana 0, 'The Fool'. If you look at the house that the is in for the rising spread of year 0, that house is assigned The Fool as its archetypal outward--or rising--energy. Look in the diagram above and notice that for year 0 the represents the Fool in the rising spread and the represents the Fool in the moon spread (see the Karmic Wheel). By extending this, and following the through the first 22 quadrations, the house where it falls in each successive year indicates the house in the framework to assign to that Oracle. From this it will be seen that for the first 22 years--taking into account both the moon spread and rising spread--the will have experienced 44 of the 45 available houses> in the framework. The only house that will not have been experienced is the birth house (that which they own in the sun spread), which will be entered at age 44. This will hold true for all members of the Karmic Wheel. For the fixed and binary state cards, they will have experienced 44 of the 45 available combinations of card energies transiting through the houses surrounding their house. On the 22nd birthday, the rising and moon spreads will crisscross on the Karmic Wheel, and for the second set of 22 Oracles the will walk the path in reverse, experiencing the Moon energy from the standpoint of the outward Rising position and vice-versa. Remember, these statements are symbolic in nature. It is important for any card reader to become attuned to their intuitive powers in order to make effective use of this system. In the diagram, you will see that any house will be colored yellow, blue or purple. The house has its own color. Yellow Yellow represents that the experienced that house from the rising spread during the first 22 years. Blue Blue represents that the experienced that house from the moon spread during the first 22 years. 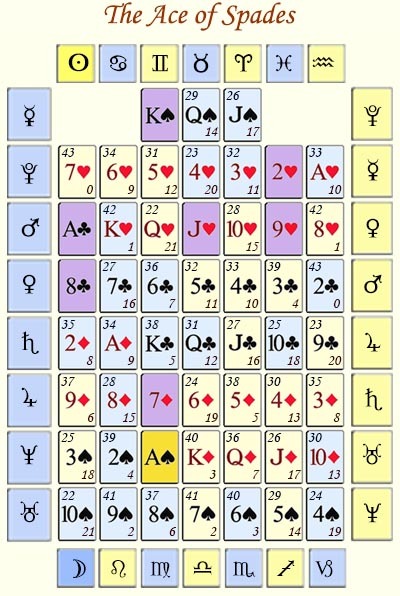 Purple Purple represent the fixed and binary state card houses. Those houses are not affected by the movement of the through time, but rather each holds a specific position in the framework that is associated with one of the 7 rays of Spirit. These 7 karmic rulers represent anchor points that connect the karmic wheel with the cosmos as a whole. Gold The has its own color, indicating that this house represents the gateway to and from the Spirit realm. For each of the yellow and blue card houses, the Oracle indicated will be shown in the bottom right corner based on movement of the . This Oracle represents the Tarot Major Arcana Oracle relative to the number shown. There will be 2 instances of each Oracle based on the movement of the , one indicated by it's position in the rising spread, the other for the moon spread. The second 22 years are always reflective of the first 22 years, so the year shown at the top left represents the year when the was on the return path home from Oracle 21, 'The World'. It is not by accident that the was chosen to represent humanity in its traversal through the Oracles. The signifies the seed of humanity, the archetypal emergence onto the material plane. It is the doorway both to and from the Spirit realm. It is no wonder that it is the symbol chosen by the Order of the Magi to represent their organization. You will only be able to understand the role of the through use of your intuitive powers. When looking at Life from the standpoint of time, the totality of humanity is represented as 1 point in time. As the time unfolds, humanity evolves, and that point within time moves and describes a path. But from the standpoint of time itself, the movement of that point--or all of its points in totality--makes up the true picture of humanity. The points are not linear, one following another, but are taken as a whole. If we accept that as a given, then the concept of past and present takes on a different meaning. In essence, there is a reflection of the Future, through the Now, from the Past. It is like a sine wave, repeating exactly the same vibratory rate present in the Past, the Now and the Future, only working upon life through different circumstances. In this way, by anchoring to our pure potential (the sun spread) and atoning for the Past (the moon spread) we will automatically harmonize the Future (the rising spread). The phenomena of the should be analyzed in and of itself, without regard to the framework, or even any of the other cards. This will be left as an exercise to be accomplished individually, but let's use an analogy to give a few hints about the function of this card. When we emerge onto the earth plane, we do so through the gateway of the . At any moment in time, circumstances present at that moment are unique. When we are still young, we can see the gateway clearly and there is an undeniable connection to the Spirit realm. Over time, however, the moment of birth slowly disappears into a myriad of memories generated by our momentary choices. At the end of life, the natural hope would be that we find the gateway that we entered through at birth in order to return to our True place within Spirit. However, having lost the memory of our moment of birth, fear that the gateway will thus not be found leaves us with a feeling of dread. That feeling permeates our waking life, often overshadowing our ability to look within to reconnect with the innocent nature of our youth. This becomes a fear that now gets associated with the (and for spades in general). The good news is, when leaving this lifetime, we exit through the gateway of the , and the Spirit realm will look the same no matter what moment is chosen for the time of death. We do not need to fear death since all doors lead to the same place. The Spirit realm can be loosely associated with the picture that all of humanity represents from the standpoint of time. That picture remains the same regardless of any point that may be seen as a part of it. In other words, it matters not what point we choose to leave this realm; all points return to exactly the same place. When we take the time to look within in order to release judgment and allow our youthful nature to permeate our thinking, access to The Gateway becomes available. This, then, is the first step towards taking back the power that was awarded us at our moment of birth.